All of the products in our catalog, plus many more, are available for purchase online 24 hours a day, 7 days a week. We offer a secure environment for your privacy and protection. When ordering from our catalog you can call you order in at : (United States, please call: 1-888-512-9069 (Toll Free) (M-F 8 AM to 5 PM EST)) From all other locations worldwide, please call: 1-770-458-5539 or mail your order in using the mail order form in the catalog. You may also use the Online Quick Order Page online using the catalog part numbers (please drop any leading zeros from catalog part numbers). Catalog prices my be out of date (old catalog) or not reflect recent price changes. If ordering by mail, it is a good idea to call customer service for current pricing. We accept Visa, MasterCard, Discover, and American Express credit cards. International customers must pay any customs charges, VAT, taxes and other costs in addition to the shipping charge. Use personal checks, money orders or cashiers checks. Do not send cash! Personal checks must have your name and address pre-printed. Also it must include phone number, hand-written if necessary. In the case of new account “starter” checks or checks without street address and phone number, orders will be held 14 business days for clearance (no exceptions). All orders paid with checks written on credit card accounts will be held 14 business days for clearance (no exceptions). 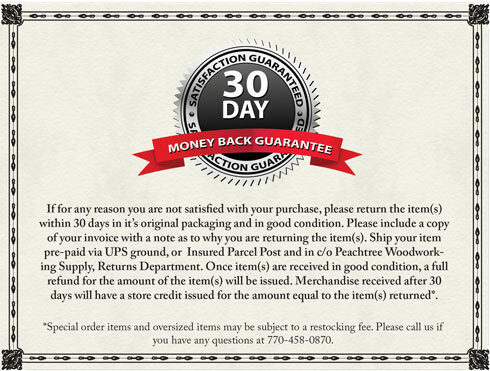 Once your order and payment is received, please allow 7 to 10 business days for delivery, based on availability of items. If this is your first order with Peachtree Woodworking Supply, Inc., your payment may be subject to an 14 business day hold for bank clearance. Any check or money order returned unpaid will be charged an additional service fee. If ordering by mail, it is a good idea to call customer service for current pricing. Call 1-888-512-9069 (Toll Free) (U.S.); 1-770-458-5539 (Internationally). Come see us at a Woodworking Show near you, See the 2013/2014 Show Calendar Here. We regret that rapidly rising costs for raw materials and shipping necessitate the raising of some of the prices of our products. Peachtree has made every attempt to avoid these increases, but we refuse to compromise on quality and service. We think you will agree that the quality of products should not be sacrificed. Our website has the most current up to date pricing, however, the catalog prices my not reflect the increases as of yet, but will show the increases in our next issue. We wish to thank you for your valued business and hope that you will understand the necessity for these price increases. Peachtree Woodworking Supply, Inc is required by law to collect sales tax on all orders being shipped to California and Georgia. Sales tax will be calculated on both the merchandise and shipping & handling fees. Tax exempt customers please read section below for information on declaring the exemption. Peachtree Woodworking Supply, Inc does not collect taxes on orders that are place online with other states. Please note that you may be responsible for paying sales/use tax to your state or local taxing authority on orders being shipped to your state. Tax exempt customers when placing an order on our website your order will show taxes when you check out. You must provide a signed Tax Exempt Certificate (Not a Copy Of A Licence) prior to us processing your internet order internally to Peachtree Woodworking Supply, Inc. The Tax Exempt Certificate is a form from California or Georgia in which you attest to the fact that you are a tax exempt organization and not required to pay tax on item purchased in the state you reside in. Please provide your tax exempt customer number on the Tax Exempt Certificate. You may send your Tax Exempt Certificate by Fax or by mail. Please Note: Sales tax will be collected on the order if we do not receive a signed Tax Exemption Certificate before we process your order. Prices are subject to change. Pictorial and typographical errors are subject to correction at time of order. Peachtree Woodworking Supply Inc. reserves the right to refuse any order. Peachtree Woodworking is not responsible for any typographical errors posted on-line. E-Direct Special Offers are valid only for orders placed online or by phone at time of promotion and cannot be combined with other sales offers or applied to previous orders .Previous purchases from a Woodworking Show do not qualify for E-Direct promotional price. Peachtree Woodworking Supply, Inc. reserves the right to limit quantities, correct errors or omissions and modify or end E-Direct promotion at any time. To sign up for the e-Direct Savings Club, Just click the link below and enter your email address and start recieving discounts up to 60% off selected products.